Roofing Company Fitchburg: Should You Replace or Repair Your Roof? 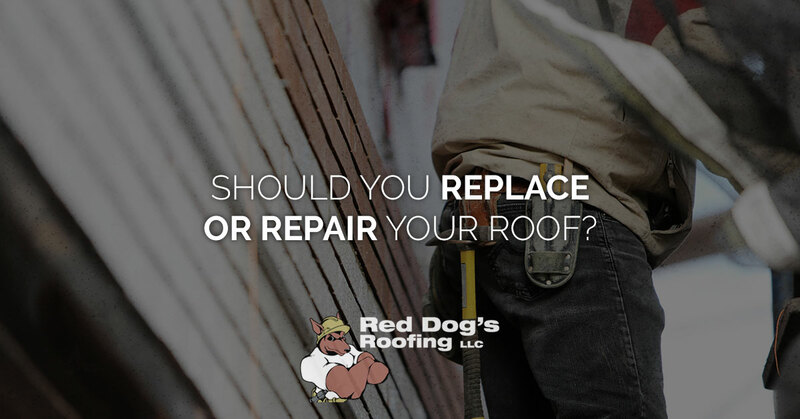 If you have a roof that’s a bit out of shape, you may be asking yourself, do I need to have it repaired? Or is it time to replace my roof? It’s an important question, since the monetary difference between a repair and a replacement can be in the thousands. First thing’s first, take a look in the attic. If you see any signs that moisture has permeated your roof, that means that it’s no longer doing its job. Look for leaks, water spots, and mold. You may also notice that your roof is bowing, which could be an indication that the wood structure of your roof has been compromised. If you notice any damage in your attic, you have a serious problem on your hands — start thinking about replacing your roofing material. Next, take a look at your roof itself. Do you have visible damage that spans all of your roof? Or have you just lost a shingle or two to a tree branch? If you have damage that’s visible over the entire surface of your roof, then you’d better call a roofer for a full replacement. Irreparable damage may include hail damage, damage caused by high winds, or damage from pooling water (which can occur if your gutters are clogged or your roof is misshaped). On the other hand, if you have a newer roof with a few minor defects, then you’ll likely be able to have your roof repaired. Now, you may still be uncertain; do you need to replace your roof if a third of it is damaged? What about an eighth? Well, it’s best to discuss your options with your roofer. In some cases, it may be more economical to repair part of the roof. Yet, it may make more sense to replace the whole thing in one fell swoop since you’ll have a uniform looking roof, and you can rest assured that your new roof will likely last for at least a decade. Talk to your roofer for the best insight. Most roofs weren’t built to be home to living material. If you have a roof that’s caked in mold (or it may even be growing some plants), then it’s probably far too old. While slate tile roofs may only need a cleaning to rid them of mold, mold is usually a sign that your roof is compromised. Mold takes time to grow, and it can penetrate the subsurface of your roof, which means that your home is at risk. Mold may be a serious indication that it’s time to replace your roof. You might be able to tell if you need a new roof without even looking at it… which is to say, you can take a look at your current roof’s warranty information and records to help you determine the age of your roof and the coverage that you may or may not have. Your roof is more complex than a few shingles slapped on plywood. It has flashing, gutters, and a protective subsurface. Hire a professional roofer to take a thorough look at these other components. If you have flashing that is cracked or flashing with failing sealant, you might have water leaking into your home. Your gutters are just as likely to fail. Keep them clog-free (that’s an easy fix), and make sure that they don’t spring a leak — the seams and corners are most likely to leak due to wear and tear or corrosion. Don’t let your gutters cause pooling on your roof, and make sure that all of the water that is shed from your roof is directed away from your home’s siding and foundation. If you have an issue with the subsurface of your roof (the protective surface that is applied beneath your roofing material), then your roof may no longer be waterproof. Once again, you might only notice an issue in your attic. If your roofer suspects that the subsurface of your roof may be compromised, he may pull up a shingle or remove a shake or two in order to assess the health of the roofing subsurface. Not Sure About Your Roof? If you’re still not sure about whether it’s time for a repair or time to replace, don’t fret. We’re here to offer you the best solution for your unique situation. As your local, Fitchburg based roofing company, we can assess the condition of your roof, and provide you with a plan of action to ensure that your roof is impervious to our storms. If you’re ready to get started, don’t hesitate to make an appointment for an inspection! We provide roofing services for folks throughout Fitchburg, Leominster, Gardner, and the surrounding area.